Construction has started on a new medical office at 127 Pinesbridge Road. 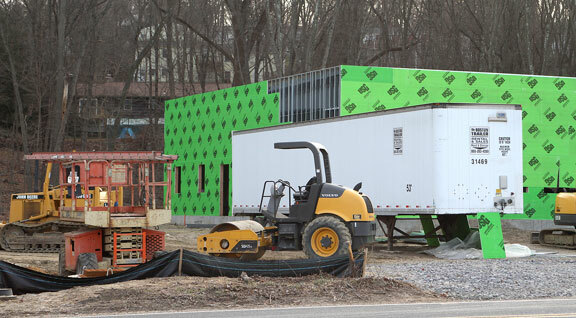 BEACON FALLS — The town’s only medical practice is moving. The husband-and-wife medical team of Sudipta and Bindu Dey are planning to relocate into a brand new building down the street from their current practice at 45 Pinesbridge Road to 127 Pinesbridge Road. The new building, which is currently under construction, will more than double the space for the medical practice. 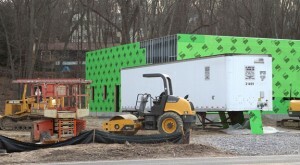 Their current building is about 2,000 square feet, while the new building will be 5,000 square feet on a 1.77 acre lot. The doctors plan to move to the new building in late spring or early summer, according to Dr. Sudipta Dey. Sudipta Dey said his practice has grown since he came to Beacon Falls almost 10 years ago. Since then, his wife, who was working in Shelton at the time, has joined him. Sudipta Dey said he sees a few thousand patients at his family practice, from all of the Valley towns. Dey and his wife are originally from India, but they came to the United States via England, where they were licensed in internal medicine. They had to go through training and licensing again in the United States. Griffin Hospital helped Sudipta Dey get on his feet in Beacon Falls, funding renovations to his current building and paying his salary until his practice was up and running. Now, Sudipta Dey runs his practice independently, but he said he still admits patients to Griffin Hospital. He is paying for the new building on his own. Once the new building is complete, Sudipta Dey said it will have office space for specialists and a new lab and he would add more services to his practice as time goes by. First Selectman Gerard Smith said the move shows that Dr. Dey has a firm base of business in Beacon Falls. “We welcome him and hope he stays for a good long time,” Smith said. Smith said he hoped the doctors’ success will attract other medical businesses to the town.